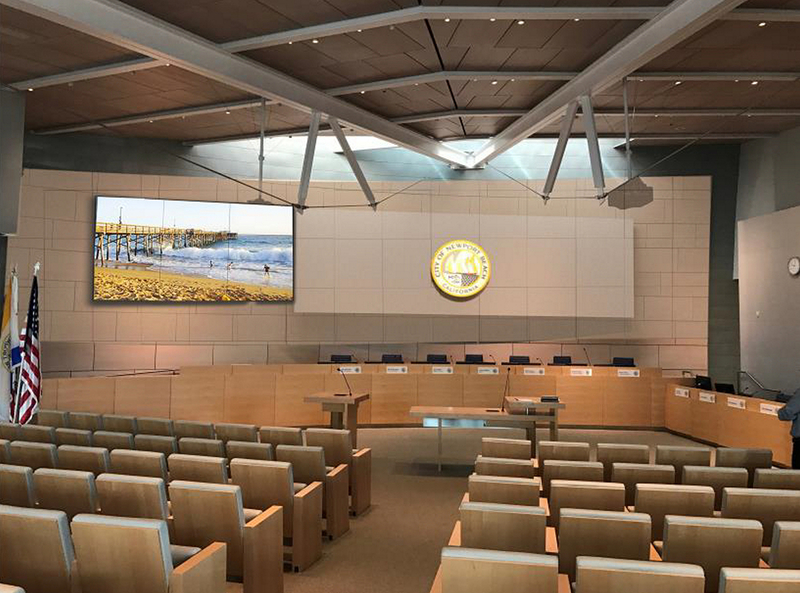 A rendering of a built-in video wall comprised of nine 55-inch monitors on the left with the city seal moved center and the current projection screen removed, one of the options staff presented to Newport Beach City Council Tuesday during a study session discussion on audio and video improvements to council chambers. 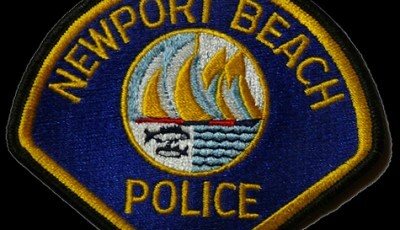 Newport Beach City Council debated Tuesday about what audio and video components in council chambers needed improvement, and how much they should realistically cost. 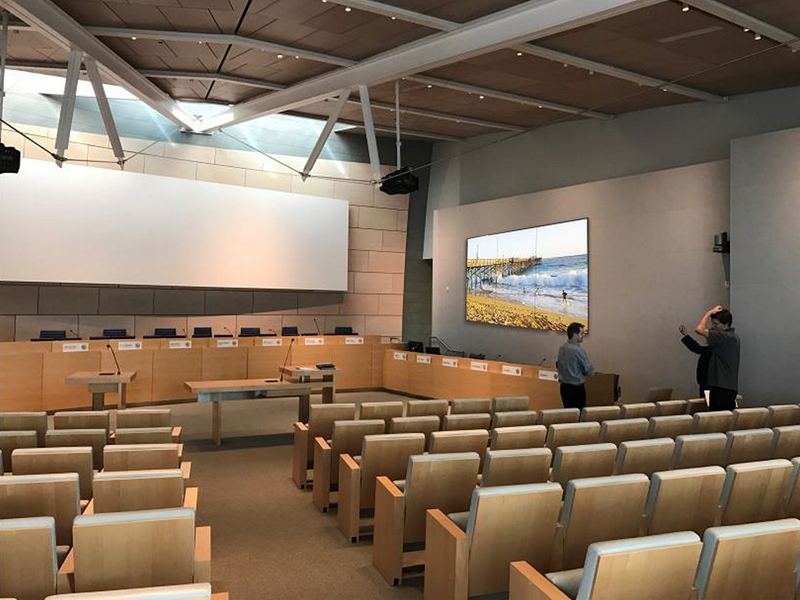 Staff presented options as simple as changing out a single wall-mounted video camera for $9,000, to replacing the entire projection screen with two sets of bezel, built-in video walls comprised of between four to nine 55-inch monitors for around $200,000. 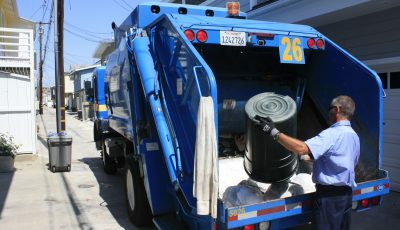 Most Council members initially said they could not justify the cost or thought it wasn‘t a wise use of funds. “I just don’t see this as a good use of capital,” said Councilman Kevin Muldoon after first hearing the presentation. He was more receptive to the idea of staff possibly finding more cost effective ways to do some of the improvements. Ultimately Council directed staff to put out a Request For Bids to find out more about pricing. Councilman Scott Peotter, who brought the idea forward, asked for it to be “a la carte” style, so the Council can pick and choose what they might want. Peotter relayed concerns to city staff during the past year about the effectiveness of the audio and video equipment and Tuesday’s study session item was a presentation of possible equipment improvements. The building is now five years old, which is equivalent to 50 years in technology terms, Peotter said. His primary area of concern was the large projection screen mounted behind the City Council dais. It’s not fully utilized and detracts from the aesthetics of the room, he noted. 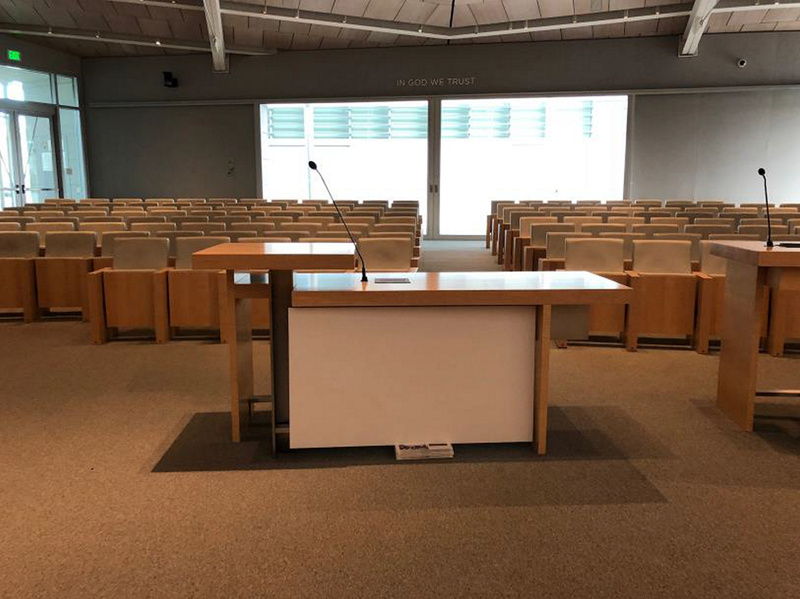 The “big, white, ugly” projection screen behind the dais that is the most dominate feature in an “otherwise beautiful” council chambers, Peotter noted. A rendering of a built-in video wall comprised of nine 55-inch monitors above the staff table to replace the current projection screen, one of the options staff presented to Newport Beach City Council Tuesday during a study session discussion on audio and video improvements to council chambers. “It’s something that’s kind of bugged me since this building was built,” Peotter said. It is also hard to read at times because of the light coming from the skylight above, he added. He suggested removing the large projector screen and moving the city logo directly over the middle of the council dais. The idea is to replace the screen with two video walls: One over the staff table (from the middle of the audience perspective, it would be a considerable angle to the right) and one where the city logo is currently located (sitting in the audience, it would be a slight angle to the left). The video wall would be a set of nine or four 55-inch monitors “tiled” together, explained Deputy City Manager Tara Finnigan. It would cost about $195,000 for the set of nine, or about $80,000 for the set of four, both estimates include labor and structural support. “We’re seeing more and more video walls these days,” she said. They usually produce brighter, higher quality images, Finnigan added. If someone makes a presentation from the public speaking podium, it would be better if they could point to a display on the side, Peotter noted. Muldoon asked about putting only one tiled set of monitors behind the staff desk, which staff roughly estimated would cost $80,000 to $90,000. “I can’t even justify that,” Muldoon replied. “The screen behind us is adequate and I think it would be an egregious waste of money to change out technology that’s only five years old.”. Mayor Marshall “Duffy” Duffield called the $90,000 estimate “hard to swallow” since the monitors themselves aren’t nearly that expensive. Councilwoman Diane Dixon said she’d like to hear from the people who actually sit out in the audience to find out where they would prefer looking when they watch presentations. “Before we give up on it (the current large screen), I’d just like to know a little bit more,” Dixon said. 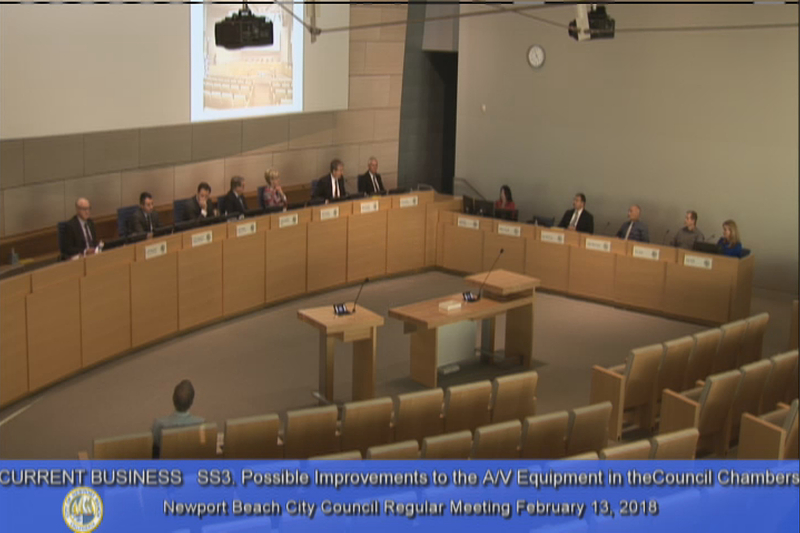 A screenshot of the NBTV video feed of the Newport Beach City Council meeting as they discuss possible audio and video improvements on Tuesday. Another option would be to replace the projectors, Finnigan noted. With new technology they can get better projectors that would produce a brighter image. New laser projectors would cost roughly $57,000, including installation. They could also be positioned better in order to project two images at the same time (as it was originally intended). For example, the agenda could be displayed on one side of the screen and a presentation on the other side, or possibly one large image spread across the screen. 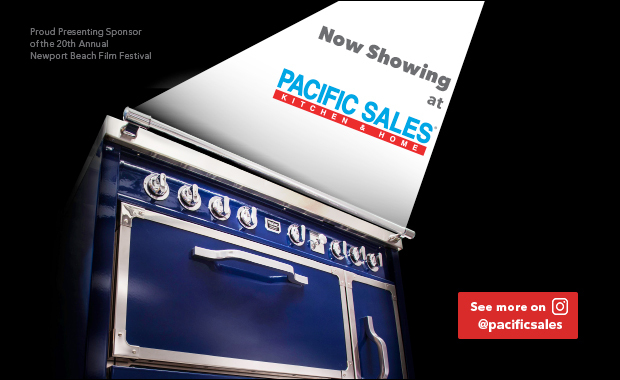 Currently, the projectors are placed slightly off so that the images overlap when projected onto the screen. “That location is just off enough that it doesn’t work correctly,” Finnigan said, pointing to one of the projectors. The current projector that’s could be moved and placed correctly, she added in response to Dixon’s question about fixing the current setup. “It might be less expensive to move that than to invest in new screens that are going to be out of date in a few years again anyway,” Dixon said. 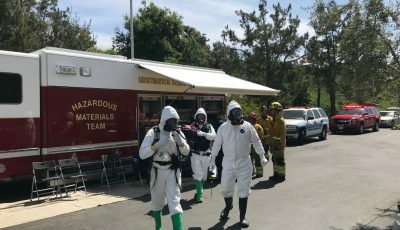 The aim is to pay for at least some of the improvements using the Public, Educational, Government funds, which can be used toward NBTV-related capital costs. “PEG funding is the one percent in video fees that we collect, it’s to be used toward the government channel,” Finnigan explained. Those fees, by federal law, are designated for PEG-related capital costs: PEG facilities, transmission of a PEG channel, or the production of PEG. A rendering of a “confidence monitor,” that would display a live feed of NBTV, one of the options staff presented to Newport Beach City Council Tuesday during a study session discussion on audio and video improvements to council chambers. Any other costs not covered by PEG would be expensed to the general fund. 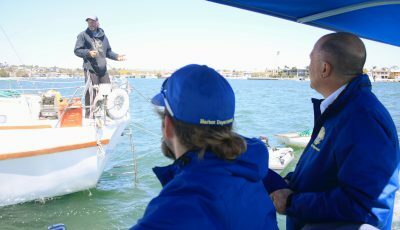 “We’ve got improvements that we can make we’ve got a fund that we really can’t use for anything else,” Peotter said. Some Council members mentioned that the PEG funds would be better spend addressing the complaints about the transmission quality and the low audio for home viewers. Peotter also pointed out that council members are looking down at their monitors during a presentation. “It looks like we’re asleep,” from the audience or at-home viewer’s perspective, Peotter explained. Staff suggested a “confidence monitor,” a 55-inch monitor placed between the two public speaker podiums and facing the council members. It would display a live feed of what’s being shown on NBTV, Finnigan explained. There is an approximate 30-second delay in the feed, so this would enable council members to see what the viewers at home were seeing and they could pause or keep an image up slightly longer. The “confidence monitor” by the public speaker podiums would not be very helpful, Muldoon noted. 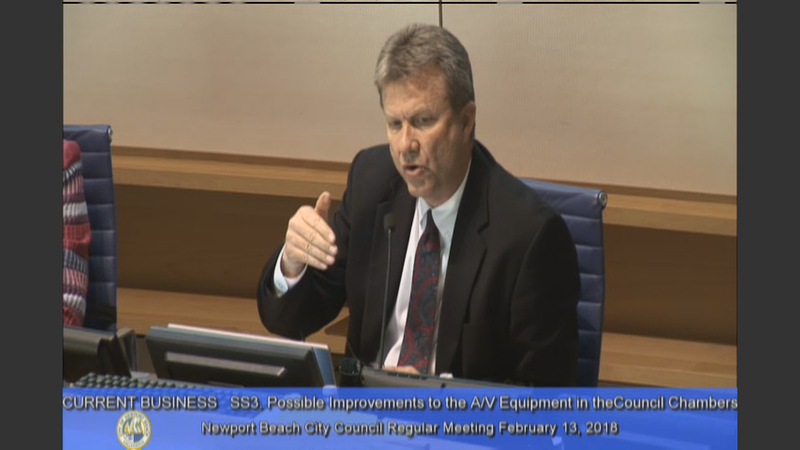 A screenshot of a close-up of Councilman Scott Peotter of the NBTV video feed of the Newport Beach City Council meeting as they discuss possible audio and video improvements on Tuesday. The last suggested improvement from staff is a new camera to replace the one in the back by the main door. It’s used to get close-ups of council members when they are speaking, Finnigan explained. The focal length isn’t quite long enough to get close without the image being slightly blurry. Another issue several Council members and public speakers raised was the angle of the podium. In the old city hall council chambers, the podium was angled so the audience could partially see the speaker. In the current chambers, audience members can only see the back of the speaker. There was also talk of improving or adding video in the community room, friend’s room in the library, and possibly at Marina Park.